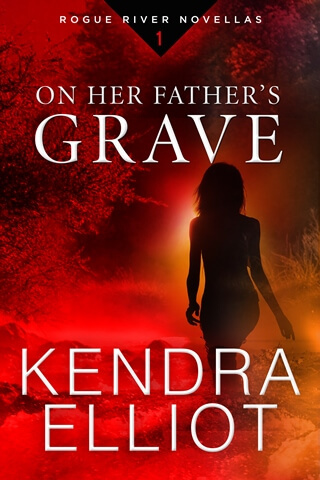 The first of four thrilling Rogue River novellas, On Her Father’s Grave launches a new romantic suspense series from Kendra Elliot and Melinda Leigh. I wasn’t much of a fan of novellas and because of that, I sat on this book for a while but decided to read this over the holidays. Well, I ended up reading six of the eight books in the Rogue River/Vows/Winter series in one day! For a novella, this book packs everything into it and is very addictive. If you love a good suspense, this book will draw you in and you definitely won’t stop until the very end. If you love a slow-building romance, you’ll also love it. Stevie Taylor couldn’t wait to leave Solitude, Oregon for the big city as soon as she could but after five years in the LAPD, the anonymity and loneliness of the big city as well as the pressure of the job got to her and she gave it all up for a job on the police force of the small town she grew up in and the closeness within the community which she longed for while away. But her return is bittersweet because her father, who had just passed, cast a wide shadow over the community and the police department where he had been chief. Stevie has got big shoes to fill and even before the first day of work, she’s on the job when a teen dies under mysterious circumstances and the skills she got working with the LAPD will come in handy as she works closely with the new police chief to unravel this case. Zane Duncan went from a regular officer on the Solitude PD to police chief with no warning and just in time to catch a case that will need all of his skills to solve and just may mar the tranquility of their quiet town. For Zane, a lot of this is personal because he considers Solitude his home even though he hasn’t lived there long. In addition, Zane finds himself falling for the town’s newest officer and daughter of his late mentor, but will he be able to convince her to give him a chance? I really enjoyed this book and the overarching mystery was gripping enough to make me keep reading each new installment of the series. The characters are well-developed and Ms. Elliot captures the secrets and layers in this small town so very well and will definitely have you longing for the next book in the series. Kendra Elliot won the 2015 and 2014 Daphne du Maurier awards for best Romantic Suspense. She was also an International Thriller Writers' finalist for Best Paperback Original and a Romantic Times finalist for best Romantic Suspense. She grew up in the lush Pacific Northwest and still lives there with her husband, three daughters, two cats, and a Pomeranian. She's always been fascinated with forensics, refuses to eat anything green, and loves a strong Mai Tai on the beach on Kauai.